To eradicate social and other evils, superstitions and to strive for the upliftment of the moral character and values. To encourage non-professional recital of gurbani (Kirtan) and to launch a staunch campaign for the same. To educate people about the ill designs of unholy and untruthful individuals, who personify them selves as Guru and to strengthen the respect dedication & faith in Shri Guru Granth Sahib. To restructure and transform the society into caste less social system (Jaat Paat Ate Nasha Rehit Samaj) based on universal brotherhood of mankind and fatherhood of God. To launch a movement in the fields of Literature, Culture, Social Service, Education and other aspects, as per universal welfare approach of Gurbani. The basic principle of working procedure is to spread the knowledge, gain and provide the information and to create the awareness for distribution of knowledge and information. Education is the basic & natural working procedure of Study Circle. It is a great desire of Study Circle to adopt the modern technique of publicity for knowledge of Gurmat. Every volunteer shares the knowledge with others for his spiritual and moral progress according to Gurmat procedure/Method and remain effective for the development of new society. There are various methods to establish relationship of message such as Seminars, Samagams, Shabad Vichar Samalans, Contests, Kirtan Samagams, Personality Development Camps, Audio Video method and personal contact etc. The workers of Guru Gobind Singh Study Circle has created a distinctive history for voluntary services in the different fields during 32 years of it’s establishment. The works of approximately 50 projects/wing/organization are running with high spirit/enthusiasm under one control. It could have been possible only with the great blessing of Almighty God therefore it is progressing day by day. Total works on central office level have been divided into 8 directorates and 54 zones for the smooth running. This organization is working in 17 States & 11 Countries through it's unit apart from Panjab. Inter-College/Inter-Schools Youth fairs are being organized in colleges/schools in Punjab by “Mata Sundri Memorial Trust” every year. There are contests of recitation of Gurbani, Poem, Lecture and Quos. Thus there is natural communication of moral worth & values among the students who participates in such fairs. A great response in being received due to participation of great number of students from the schools/colleges. This action has been proved more effective due to distribution of prizes on country leval. The main aim of these workshops is the personality development, creation of social awareness, regarding religious heritage among the students. The different aspect of personality development of children are highlighted as per Gurmat tradition so that all round preparation may be made for bright future. Special efforts are being made for training the method of living as per Gurmat-in-personality development camps. There are great chances for removing the doubts during the stay together for long duration in the camps. These methods of camps for balanced development of the student are proving fruitful. System of training camps for youth leadership are continued with the moto development the of leadership qualities, ambitions of self-services and works for the welfare of all among the students of colleges. Where there are one day educational lectures on the history & method of livings through educational kiyarian in the school, there the students take part in question answer and Quiz competition with great ardent desire in such kiyarian. The great contribution of educational kiyarian is becoming Fruitful for awaking of basic curiosity related to Gurmat among children due to open discussion on Guru’s History and Rahat Maryada from morning to evening at a time with the student of one school. To creat the awareness regarding social surroundings among girls students, after taking the inspiration from the great sacrifices and religious faiths of sikh ladies such samagams are being celebrated. This day is being celebrated as annual day of school/colleges with a view to get the inspiration from the life of Mai Bhago and other historical Sikh ladies. It is customary to organized such samagams in colleges with a view to creat firm faith in complete shape of Sikhism among youth. By virtue of these samagams hundred degraded youth have taken vow to be of complete shape. It is being organized with a view of filling love towards religion, faith and firm determination in the light of scientific way. Openion meetings are being organized on various method for existence of living creature in schools/colleges. Efforts are being made to follow the foot print by celebrating the Gurupurab, Guru Gadi and martyrdom day through units in schools/colleges & to creat a firm determination in the heart of students regarding religion contests of poem, poetry, lectures and Ques are being arranged during these samagams. Ji Aya Nu Samagam are being arranged by the Study Circle to give love, affection and welcome to the new students who have taken the admonition in schools, colleges and universities. This system is proving affective to join them with our rich heritage. The system of distribution of scholarship to the suitable and needy students for their educational requirements in form of financial add is in force under the scheme of sahibzada Ajit Singh organizational Trust in the backward rural area. Every year, a unique stage is provided by student wing of Guru Gobind Singh Study Circle to established the unit for those male, female students who will be mobilized with shikhi spirit. A suitable environment is provided for the development of good leadership among the students by establishing the working committees in these units. System of International Educational Conferences has been started with the view of world peace and universal brotherhood by student wings. Students from all universities and colleges from all over the world collectively discuss about the suitable environment and promise for to stroll about according to “Subh Ko Meet Hum Apan Keena”. Visiting of pilgrims and historical places in troop collectively for few days with one aim brings purification of thought, co-ordination, service, helping others and cooperation. We get power and direction from the Guru’s Jiwan and valuable places of cultural importance, which increases the educational knowledge. It has come-out from the survey by the Study Circle that the main reason of out cast of the children is due to non-compulsory to decorate the dastar in colleges. An accustom has been started for training and contests of dastar by Study Circle. Orientation Courses, personality development and educational training center are arranged by Bhai Khan Singh Nabha Institute with a moto of giving incentive to Students, Teachers, Scholars, Authors, Services men, Enterprising, Ragi/Granthi Singhs, Senior Citizen, Exegete, Artists and Expert who are serving in different social field. Good training pertaining to school becomes the basic of higher education. Gyan Anjan Public School Established with this moto in Gurdaspur and Samana (Distt Patiala) are running success ful. Gyan Anjan Gurmat Summer Schools are organized in all the zones during the holidays. Training Classes for Punjabi language, Sudh Gurbani Paath, Kirtan, Basic concept of Gurmat and fencing are arranged during the summer vacation specially in out side zones of Punjab. 40 schools have been established in Ludhiana Distt with the cooperation of voluntary organization for those childrens, who have been deprived from the education due to some compulsion. In these school child Labourer up to the age of 6 to 10 years are being given the education up to primary standerd. Guru Gobind Singh Study Circle has sponsored two such schools. The basic aim of this educational counsel is to gather the ideas of readers as well as expert of educational policy and review the syllabus of different classes. Efferts are made to include the good cause in syllabus. Free medical camps, Blood donation, Eye donation and checking of blood groups are organized with a view of service to patients. Bhai Ghanahiya Sewa International for the benefit of needy person. The basic work of the unit is to organize special health day, Nasha Choro Divas and awareness of Aid Dives on the eve of Gurupurab. The poor patients admitted in the different hospital are being helped vide poor patient funds. Efforts are continued for other services apart from honouring the doctors of the different fields. Every year, Parkash Divas of Sri Guru Harkrishan Ji is being celebrated as Sewa Diwas. Workers of different units along with local sangat go to hospital, distribute the medicine and fruits and perform the Ardas for their good health. Series of lectures on eradication of drugs, Panel Discussion, Painting Contests, Jagrity March, fair for eradication of drugs, camps for eradication of drug are being organized on central and zonal level under the movement of creation of drug free world and to save the youth from impact of drugs. For spareading the Gurmat education which eradicate the castism in the world, movement regarding abolish the castism Jagrity Saminar, Penal Discussion, Castism abolishing Diwas, Inclucating the inspiration to stop writing caste, Gotra with name and to promote the environment are the integrated part of this movement. If we can engaged the youth in sports, many problems are solved. Sport wing of study circle is instrumental for inculcating the habits of sports from the child-hood. The main aim of the wing is to creat awareness among sikh sportsmen to save them from the drug and to have the complete shape of Sikh in Sports Tournament, Family Sport Diwas and Weekly Wrestling Competition. Every year, Holla Mohalla Diwas is being celebrated as great khalsa purab with the moto to generate the feeling the Khalsa emotion among youth by the sports-wing. Efforts are being made to create the importance of our heritage and raising trend by arranging the competition of different sports on this occassion. 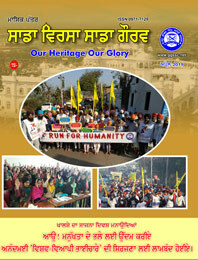 The Punjab reader and sympathizer of Gurmat have adopted this monthly journal for the last 32 years continuously. Thousands of students have gained growing direction and hundred of youth writers have became confirmed author. This monthly journal has important place among Punjabi journal which throw the light of ideas through it’s various columns. With a view for temperance of the use of the intoxication and treatment, two eradicate intoxication centers are established at Ludhiana & Hoshiarpur, where medical treatment is given by way of Allopathic, Homopathatic, and sociopathatic to desired person. The publication of Suchintan two monthly journal have been started with the view to provide the knowledge of Gurmat in Hindi language to the out sider of Punjab like wise the publication of three monthly jounal in English has been started for delivering the knowledge of Gurmat on International leval. The publication work of Gurmat literature on low price is continued. Cultural and publication wing has contributed more than 100 books and 300 aprox small tracts in publishing of Gurmat Sahit. Lectures on different subjects written by scholars and youth writers in different languages are being sent to national and inter-nation newspaper & journals through this service. The invention of feature service is a great achievement of modern time. Publication of newspaper of Study Circle in on monthly basise with the view to transmitting the activities of different zone and wings of study circle to all workers and important personalities. Different units receive the information of the activities and inspiration of each others through this paper. After the establishment of internet website and computerization of central office, state offices and zonal offices information regarding activities happening in the world are being pass on immediately. Slide shows are arranged for the knowledge of Sikh History among students and sangat through slide projector and LCD projectors. Chamber of writer performs the duty to unit the authors, scholars, philosophers and literates for thinking to contemplate and to introduce reed. The main activity of this wing is to arrange the samagam for honouring the writers, conferences, writers meets and literature seminars. Gurbani research & communication centre is doing the research work of effective ideology of Gurbani through research & seminar. Efforts an being made to remove the doubt against maryada & history of Sikhism. Bhai Sumand Singh Gurmat Sangeet Academy has been established on central level and in different zone with the moto to teach the Gurmat Sangeet/Tabla to valutry kirtaniya of fixed melody who provide the training of stringed musical instruments and arrange for exam for judgement of Gurmat Sangeet. Efforts are being made to create the love & honour towards Gurbani Kirtan among students through inter-college Gurbani contest and Tabla Wadak contents. Systems of series of kirtan by voluntary kirtaniya are in force by the different units in their field. It is important contribution of Study Circle for arranging active organizational workshop in the social & religious field by preaching the citizens of villages, cities and urban people to spare one tenth part of his time. Movement of families contact is subsistence with the aim to remove the doubt about Gurmat and social surroundings so that the progrmmes may be finalized after getting the correct information of the society and surroundings. System of Shabad Guru Samagams are in force in villages, cities and urban area with the objectives to make Gurbani Strong where the ideology of Guru Granth Sahib is being explained in easy Shabed, Kirtan and explanation. It is compulsory to pay the respect to ladies for human power apart from Seminars, Gurmat Training Camps, training for basic of business, expression of education and such other samagams are organized by the different unit of Lady Wing. These efforts are continued with the calibration and cooperation of ladies service committees & Istri Satsang Sabhawan. Sikh Book Centre is trying to provide mostly Gurmat literature, to publish ordinarily comparative religious and constructive literature in Punjabi, Hindi, English and others languages, to sale, distribute among the readers and to make sure that these are available in schools, colleges and public libraries. Giani Dit Singh Free Literature Fund has been constituted with the aims to distribute of Gurmat literature free of cost specially among students and youths. The aim of these centre is to raise the standard economically and socially by creating self employment and will power among group of ladies. Efforts are continued for the achievement of the targets by establishing these centers in every zone. Medical Chair, Foriya, Walker and such other instruments are provide only for use to needy & poor patient free of coast. Efforts are being made to establish Bhai Gurdas Library on the cenral leval with a view to distribute the literature according to Gurmat in common hands and to originate the hobby of study. To write according to Gurmat with the aim to train young writer and rising thinkers, young writers corrective centers are active. Carrier & guidness centre have been established for inspiration of youth towards self-employment and to guide them about the different occasion of services. On the eve of 400 years Parkash Purab of Sri Guru Granth Sahib Ji, this activity has been taken on the priority basis. Movement of doing the Sehja Paath of Guru Granth Sahib self by every person is in-force on higher leval. The activity regarding well seated of message of Gurbani with artistic touch in the hearts of reader & audience has been started to execute the literature through modern technique for advertisement and distribution, comics for children, to prepare video CD and communication of religious feeling with new ideas. Contacts are being established by Guru Gobind Singh Study Circle with active social & religious organization in foreign countries, So that Gurmat international activities may be developed. Cooperative projects are accomplished through Guru Gobind Singh Study Circle. The required projects are established in the villages/cities with the cooperation of foreigners. Seminars/Conferences are arranged in foreign countries through Guru Gobind Singh Study Circle in reference of Gurmat which guide the society about the religious values on international level. International Moral Education Training Camps and Student Conferences are arranged in different countries by Guru Gobind Singh Study Circle for control/supervision over youth children. Students Wing, Youth Fairs, All India Moral Education, History, Personality Development Workshop (School), Field Leval, Youth Leadership Training Camp (College), Zonal Level Educational Kiariya (School), Mai Bhago Divas, Bhai Taru Singh Diwas, Giyan Anjan Summer School, Educational Board, Bhai Khan Singh Nabha Institute, Personality development, Orientation Course, Academic Training Course. Bhai Ghanahiya Sewa Internatioanl, Movement for eradication Drug, Movement for abolishing Castism, Sports Diwas, Holla Mohala, Help to poor children, Sewa Diwas, Blood donation/eye donation. Cultural & Publication Wings, Publication of Monthly Journal, Newspaper of Study Circle, Literature Publication (Organisational working field and books as per requirement), Internet and website, preparation for slide show. Sahitkar Sadan, Writters Seminar, Gurbani research consultation information centre (Prevention of doubts on Gurbani, Maryada, Historical), Publication of monthly Jounal (Sada Virsa Sada Gourav, Suchintan, Cosmic Faith) Lecturers/Orators/Historian/Alignment Publication/organization working field as per requirement. Bhai Sumand Singh Gurmat Sangeet Academy, Nishkam Kirtani Jathe, Kirtan Series. Financial Wing, Funds Collection Wing, Annual Budget & Audit, Central Store & preservation. Organizational structure (Unit of Social Field/Area/Zone/State) Preparation of organizational cader organizational workshop, orientation courses, Public Wing (Families contact movement, Shabad Guru Samagam, Contact with different social field workers honour to selected personalities, Slid Show) Ladies wing (contacts with ladies services organization, Istri Satsang Committees), Organizational Wings (Sikh Book Centre, Bebe Nanki Training Centre, Dhur Sanjog, Bhai Gurdas Book Library, Bhai Sumand Singh Gurmat Sangeet Academy, Youth writer alignment & Training centre, Gyan Anjan Public School). The organizational efforts are more effective and fruitful. Guru Sahib has included us in working caste by threading in spiritual chain of house of pilgrims, society, hereditary. The extremity ideology of earthly & heavenly helper Guru Granth Sahib has made the character of Akal Purakh’s gift to a highest khalsa organization under the leadership of Akal Takhat Sahib for making the similarity in maryada, Sangat, Pangat, Sewa, great tradition of Simran and the prophet of kalyog. All religions sympathizers, workers and servant are requested to contribute their personal efforts into organizational working method with a view to permot the service works, so that Gurmat worth and values may be reinstalled in the society. Guru Gobind Singh Study Circle is making the required organizational efforts for the development of educational, spiritual knowledge and custom among the youths. Central office is situated in Ludhiana (Punjab) with the gratuity of Akal Purakh and with the collobration of Sangat under the guidens of Supreme Counsel through directorates Wings, organization on the eve of annual function according to fixed organizational activities, established custom by organizational system, international coordination committees, regional coordination committees, state counsel, Zonal Counsels, Area executives and unit executives among developed organizational cadre, is dedicated to perform the services mentally & monetary physically. It is humble prayer to feet of Akal Purakh that with gist of gurbani, the inspiration from the life-light of Guru Sahib and by the blessing of Sangat such a miracle caste may be created, so that all mankind may become follower of the blessing according to Shri Guru Granth Sahib.